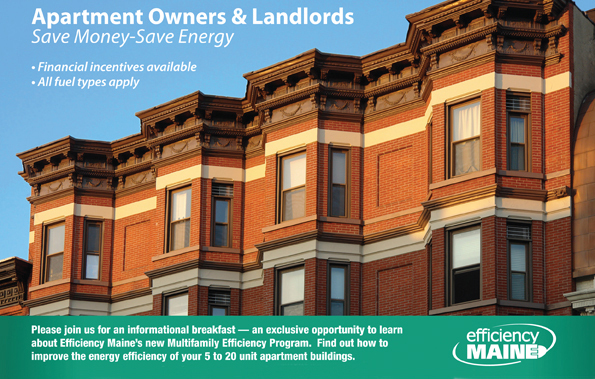 Efficiency Maine’s Multifamily Efficiency Program helps building owners and landlords increase energy efficiency in multifamily buildings of 5 to 20 units. The program offers incentives up to $1,400 per apartment for approved efficiency upgrades. Vreeland helped build awareness for the incentive program with a series of breakfast events. We created a graphically compelling direct mail postcard inviting owners to “save money – save energy” and learn more about opportunities for energy efficiency initiatives. The response to the mailings was 8 to 10%, twice the average direct mail response. More than 100 building owners attended the breakfast events, resulting in multiple efficiency upgrades with average annual savings of $446 per apartment. Vreeland also supported the Multifamily Efficiency Program with email marketing, trade shows and public relations.